International group flights with Qantas for Rugby World Cup Escorted Tours are now updated. Last remaining availability on group flights. Book now to not miss out! 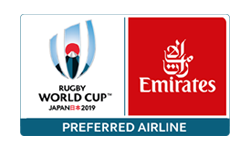 We Love Rugby now have a limited number of dedicated group flights on offer for Rugby World Cup 2019 Escorted Tours with Qantas Airways. Take advantage of our group flights by securing your flights today with only a $500 per person deposit, with the final payment not due until June 2019! There are flights available in Economy, Premium Economy and Business class on selected dates from Sydney, Brisbane, Melbourne and Perth. Any cities outside of these are on a request basis, so please contact our office. Step 1: Choose the tour you are booked on and select the package to purchase flights (i.e Taste of Japan). The flight dates coincide with the first and last day of your tour. Step 3: Select your preferred departure city. If your city is not listed on the website, please contact our office as it will be on request. Step 4: Select the number of people you would like to book for. Enter names as per passport. There will be fees involved if your name is not as per passport at time of booking. Step 5: Pay a non-refundable deposit to secure your flights. You will then receive a tax invoice which will be your confirmation. IMPORTANT: Please note, if you wish to change your return date, you will need to select the 'Date Change Fee - $75' and a We Love Rugby staff member will contact you to request your preferred return date. Once this has been requested with the airline and confirmed, your tax invoice will be cancelled and re-booked with the updated flight details and/or price. Fares are available from Sydney, Melbourne, Brisbane and Perth with Economy, Premium Economy and Business class seats. Airline Taxes: If you choose to purchase flights through We Love Rugby, please note that Airline Taxes are included. Airport Transfers: Airport transfers aligned to our flights will be available to purchase at an additional cost at a later date. Group transfers are subject to minimum numbers. A deposit is required at time of booking to secure your flights. Final balance is due by 30th June 2019. Please refer to our page of conditions for date changes and fare conditions. It is advised to read this prior to purchasing your flights. Click here to view. Fares include domestic economy flight Tokyo to Sapporo. All fares include domestic Economy class flight from Tokyo to Fukuoka.